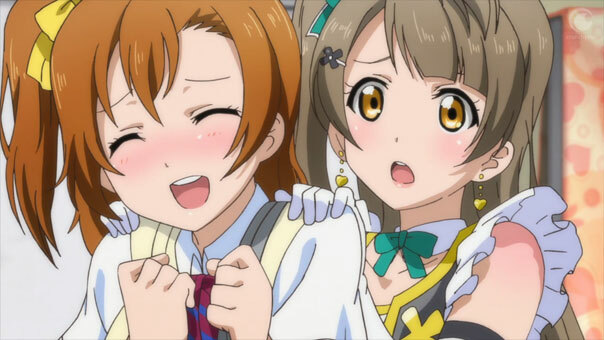 Beta-Waffle » By George, it’s Love Live Episode 11! Hang on, has this been brought up before as a specific reason behind the drop in school applications and I’ve just missed it? It’s just a bit odd that a show about idols, girls put forth as pure, untouchable objects of obsession and idolization, is putting this statement forth – more-so given it’s a cartoon on the subject, effectively meaning it’s doubling-down on the concept. It just seems to me that school idols may, infact, be more part of the cause more than necessarily the solution, you know? The metaphorical letter-bomb from two episodes ago actually makes a re-appearance here, having taken a week off. I was trying to mentally straighten out the timeline here, because some of the previous framing scenes seem a little strange, but in hindsight it looks like it actually turned up at Kotori’s house at the point it first appeared at end of the ninth episode? It’s a little confusing because, generally, you wouldn’t expect to see one letter pushed, on it’s lonesome, into a non-empty household mailbox, as seemingly occurs at the end of the ninth episode. Given it’d already had it’s postage stamp validated, however, it’s not going to be the letter getting sent, shoved into an outgoing mailbox, either – not that that’d be a valid proposition anyway, given that airmail doesn’t really take that long. It’s just a somewhat peculiar given that it was absolutely not mentioned or even hinted at in the prior episode, even though several days – if not a week – had passed in the duration of episode ten alone. 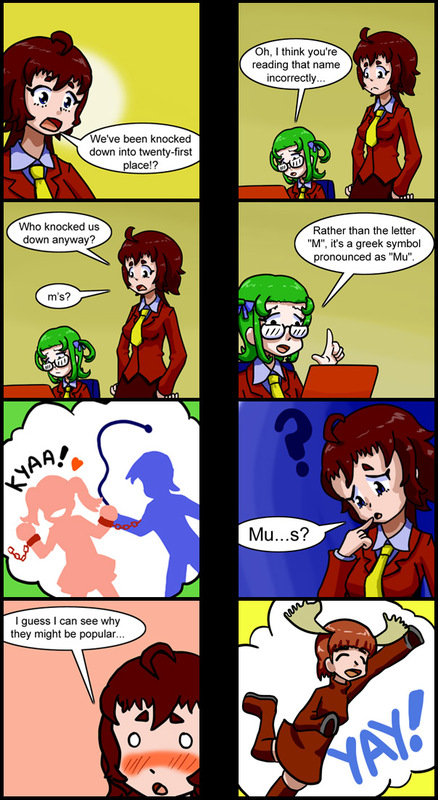 Unless the Minami household simply don’t empty their mail very often. 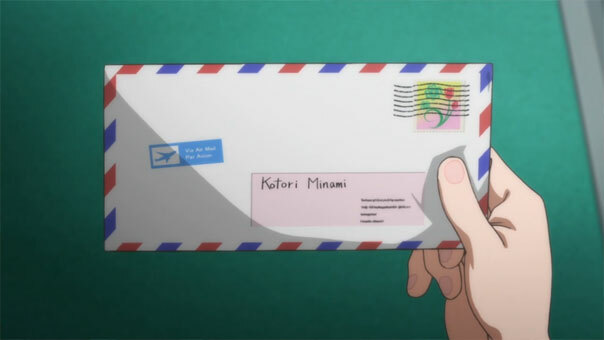 The other weird thing about it is that we, as an audience, are never clued in to what the actual letter contains, only that it is a rare opportunity for Kotori with a rather unfortunately timed deadline. If it wasn’t for the fact that stamp doesn’t look particularly British, I’d have suggested that the legend of Minalinsky has spread even to the hallowed halls of England, and that she’d be offered a place to train as a maid for royalty. Instead, I’m going to have to imagine that it’s something rather more boring. Although for all we know it could just be tickets for some WWE Spectacular which just happens to be occurring on the same day as Love Live. Or she could be undergoing gender reassignment surgery, which’d really mess up the whole Mooooo’s line-up. 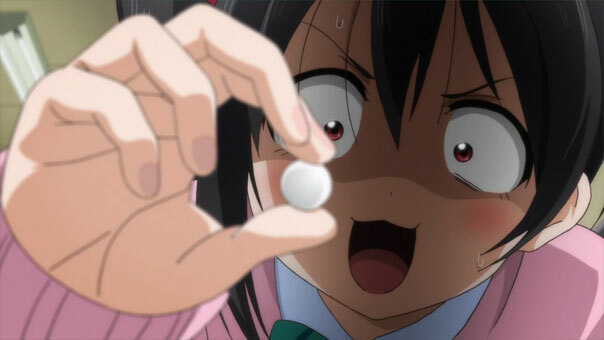 So very, very many excellent Nico faces in this episode. I was spoilt for choice in just this scene alone. Aside from the fact that two thirds of the club seem to materialize from out of nowhere in this scene, just in time to watch Nico step-up to the plate, this episode does make me wonder how often drawings like this are used to determine stage availability at Japanese school festivals. I only really wonder because, whilst no other examples from the past immediately spring to mind, there was also a similar sequence in what I guess is now last weeks Tamako Market. Of course, in Tamako it went in completely the opposite direction to how things turned out here. Also fewer goofy faces in that show. 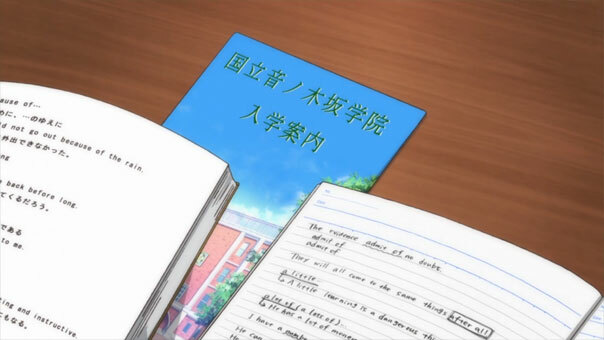 I have to admit, I like pausing anime shows to check what the random English actually says. I mean, it’s been getting a little boring as of late, but you never know when you’re going to get a smattering of Top Gun references, or essays about Ikuhara trying to pick-up girls. In this case, nothing quite so bizarre, but I can’t help but be amused by the “not go out because of the rain” line on the left there, given what’s going on in the rest of the episode. This particular scene with Umi and Honoka talking on the ‘phone triggered a sudden thought – I can’t help but notice that, outside of Honoka, Maki and Kotori, we don’t actually know much about the personal circumstances of any of the characters. Infact, I don’t think we know anything about Rin – she was just kind-of added to the group as part of a bundle-deal with Maki and Hanayo. It just makes me wonder a little about the backgrounds of the characters. 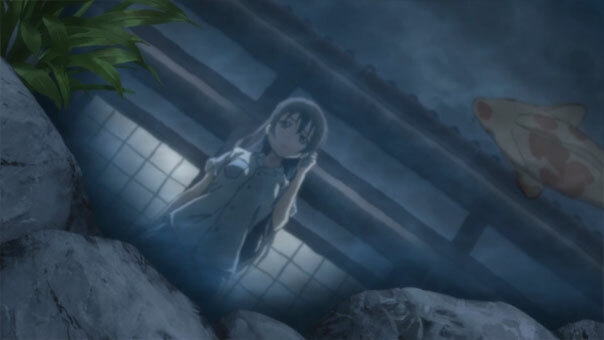 Umi’s homestead here looks traditional, but not particularly in the cheap sense of the term, and obviously Kotori is the daughter of the schools chairwoman. Whilst they got on the back of Maki a little for being the daughter of an extremely wealthy family, I do wonder if, in fact, we’re just talking about shades of gray here – they’re probably all from at least moderately well-to-do families. Which make me wonder if, in fact, the real problem the school is facing is that their entry fees are too high to be competitive! 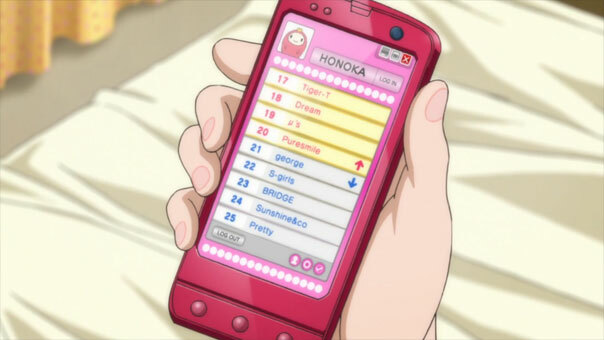 George is absolutely my favourite name for an idol unit, and I will be putting it to use in a future game of iM@S. I will also point out that Nico has a George banner hanging in the club room, so they must at least be moderately popular. Actually, I was wondering how many other school idol units we’ve actually seen in the show previously, and as far as I can tell it’s only been the three – they pretty much just keep re-using the same art and A-RISE footage which appeared in the first episode, and the posters hanging in the club-room are re-purposed from the same assets seen in Honoka’s magazines from back then. As far as these other units go, aside from A-RISE, the only other one that’s been specifically associated with an image was Number 18 there, Dream, who’re named in a magazine spread from back in the first episode, and are the unit hailing from Fukuoka. The other group, despite being on the cover of one of the magazines, wasn’t identified. 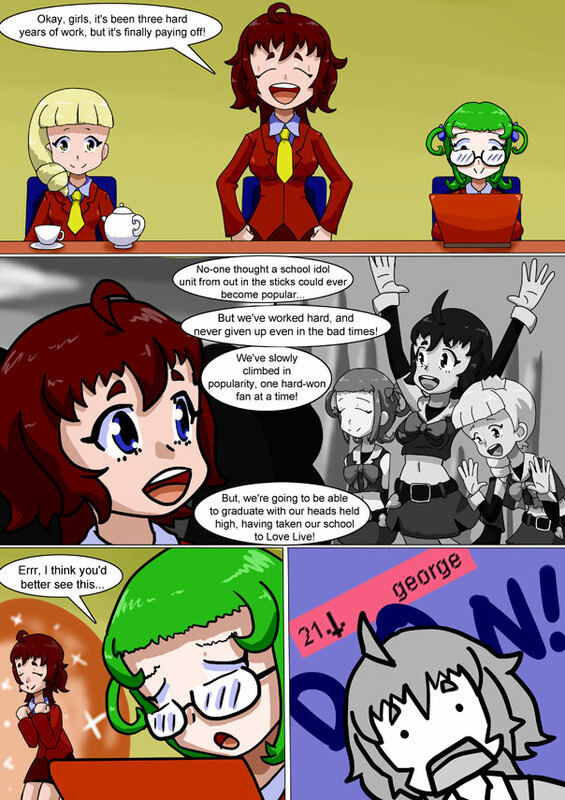 Unless by some kind of miracle they climb back up to the top twenty, I’m going to assume that they’re not George, though, mainly because it’d have been a waste to have drawn such high-quality artwork for characters who aren’t going to reappear in some kind of presumed second installment of the series. 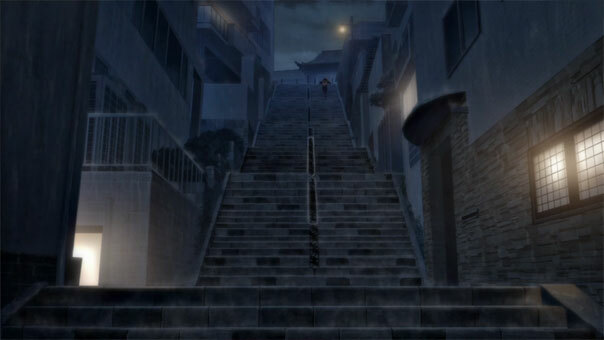 Okay, guys, now that we’ve got Honoka running up stairs in a hooded jersey, can someone with more time and considerably more video-editing competence than myself please throw together the Love Live version of the Rocky training montage? Thanks in advance. (Man, people catch fevers way too easily in anime). But I’m probably just dumb. You might notice that Maki is missing from that list – it’d follow that she’d be wearing Moon earrings, but I’m pretty sure she’s not wearing any. Her hair more-or-less completely covers her ears anyway, and I’ve got to imagine it’d cause the 3D animation staff all kinds of additional headaches to do with clipping and the like. Coincidentally, does anyone know how attendance at school festivals actually works? 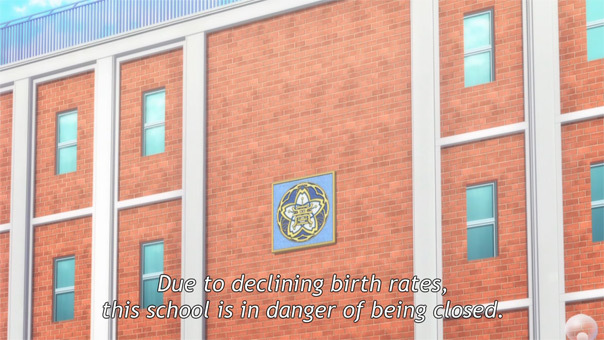 I mean, in some shows you see it ticketed, but that’s in things like MariMite where the schools are so upper-class that they’d want to control and monitor who can actually get in incredibly strictly. In other cases, you see characters suggest it’s a good chance to pick-up girls from other schools, but you’d think that they’d, you know, also have good on the same day the festival was actually occurring. I don’t even mean leaping whilst wearing the shortest of skirts this time! 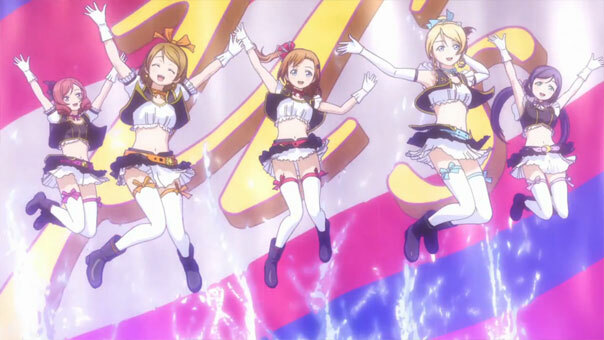 Whilst it’s cute that they did Honoka’s little dance-shuffle-jump after-all, I have to say that taking such a huge leap whilst standing in a fairly huge, likely slippy puddle, whilst also dancing on a small roof perched upon a larger roof of a tall building, doesn’t strike me as being a particularly sensible thing to do. Maybe it’s just the rain blurring things somewhat, maybe it’s some of the fruity angles they utilized in the hand-drawn cuts, or maybe it’s just the number of odd crotch-level shot that’ve been spread throughout the episode reaching a distraction-climax, but the use of CG didn’t actually seem quite as egregious in this episode as it has in a couple of the other dances. There’s a few cuts where I’d honestly not been able to tell at first blush if they were 3D renders or not. I’m also kind of surprised that the next episode preview wasn’t just a series of cuts of the girls laid-up in bed ill, given that’s what typically seems to happen if girls get even the slightest bit rain-soaked in these cartoons. Well, either that or they horrifyingly multiply like some kind of Gremlin, but I’m pretty sure that’s just Puchimas. Congrats. As part of my RSS feed catchup on the way into work this morning, your comics have successfully made me laugh while in the car with my dad driving. I can confirm that he did indeed give me a funny look. As for George, I’m surprised I didn’t notice that list at all when watching the episode. Then again, I’ve got these blog posts to help me out with that. Cheers! Moose is my new favorite idol unit of all time. I thought I had something more substantive to say, but that is all.